The Version 3.2.1 Update introduces a weld pulse measurement feature. This feature allows the Spot Welder to measure the voltage drop across the two welding cables and the Spot Welder itself. From that value it then calculates the Amps. If you are connecting the Spot Welder directly too the car battery and dont use the fuse on the positive welding cable side, the measured voltage will be exactley your car batteries voltage during the pulse. Please note this feature only works with V3.2 or later Spot Welders. You need to follow almost all the steps in the software update tutorial for V3. Instead of V3 use the V3.2.1 Software. Just the Bootloader on the Arduino Nano does not need to be updated because it already has the Optiboot Bootloader on it if you purchased a V3.2 Kit. Make sure you set the processor in the Arduino IDE to “ATmega328P OptiBoot” instead of “ATmega328P” . (See Step 1 and Step 4 of the “Updating the Arduino Nano Bootloader” Chapter in the Software Update tutorial) Steps 2 and 3 are not relevant for updating existing V3.2 Spot Welders. Then it is pretty simple to use. The measurement will be displayed if you hold down the foot switch for more than 2 seconds after a pulse or if you leave the welding tips on the nickel strip for more than 2 seconds after a pulse. Too leave the measurement screen simply push the rotary encoder button. The Amp calculation works with a fixed system resistance value of 9mOhm because it is not possible for the Spot Welder to measure the resistance. This means that the Amp calculation will only be accurate if you are using the original welding cables and place the tips on the nickel strip about 1 cm apart. If you put the welding tips very far apart, the real system resistance will be way higher than 9mOhm and the Spot Welder will calculate to high Amps. Also make sure when using the Fuse that you connect the 12V power cable that goes to the Spot Welder to the welding cable side of the fuse. Connecting it to the other side or even directly to the car battery will change the voltage drop the Spot Welder measures and therefore create wrong Amp calculation results. The pulse measurement only works on V3.2 or newer welders. 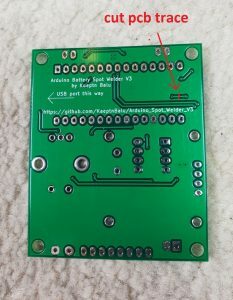 There was a little change in the V3.2 pcb layout that connects the input voltage from the 12V input pad directly to the voltage measurement circuit on the pcb. In V3.1 or older the voltage was taken from behind the schottky diode. This voltage does not drop during the weld pulse because the shottky diode prevents this. 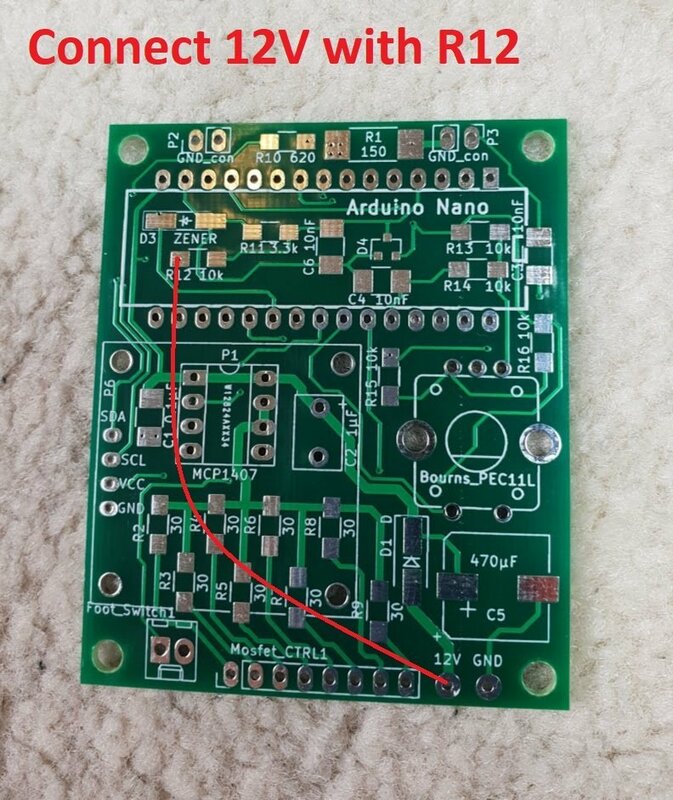 To enable the pulse measurement you need to do a little modificaton to the pcb. First cut the pcb trace marked in red on the picture. 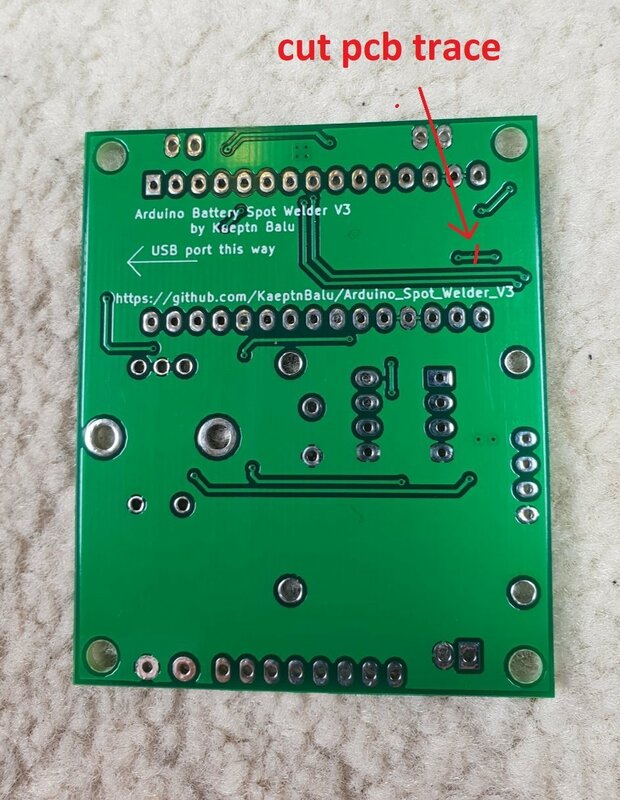 Next take a piece of thin wire and connect the 12V input pad to the left pad of R12. Yes you need to follow almost all the steps in the software update tutorial. Just the Bootloader on the Arduino Nano does not need to be updated because it already has the Optiboot Bootloader on it if you purchased a V3.2 Kit. Steps 2 and 3 are not relevant for updating existing V3.2 Spot Welders. 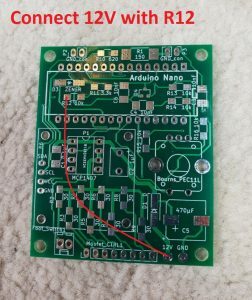 Marc, I bought a new Arduino Nano board. Is it possible to programm this new board with the version 3.2.1 software and simply replace it with the arduino nano on the spot welder. In this case i have the latest version and the version just before i can take. You dont need to do the “Updating the Arduino Nano Bootloader” chapter. If you cant get the Optiboot Bootloader working you can also use the “standard” Arduino Nano Bootloader. (Choose “ATmega328P” as the processor) Only difference is that the automatic reboot from the system menu will not work. I will need to do some reading on the programing and editing of the library files and will give this another try. My programing is not great at all but I will learn it one way or the other. I got the V3.0 working on its software. Are you getting the same error on all 3 versions or just on the latest 3.2.1 ? If you unzip the downloaded software from Github there should be a printf.h file in the folder. Also you could try the latest Arduino IDE. Maybe there is a problem in your version. i just updated my arduino with the new software 3.2.1 and it is working fine. I am using 2 parallel 12V 12AH batteries and a pulse of 5 ms. Thanks of all the work you have done great job!!!! I looked up your order and i think you are using a V3.1 Spot Welder, right ? The pulse measurement only works on V3.2 or newer Welders. I added a mini tutorial to this blog post how to modify older welders to enable the feature. I have done the modification and now it shows depending on the number of parallel 12V batteries – each one has 12AH – from 3,2 up to 4.5 Volts and according to this the estimated AMPS. Great work, thanks for all! How much for the whole spot welder kit and shipping to the us? If you put everything you need to the shopping cart it will automatically calculate the shipping cost and total. It works great , but have you ever been thinking of making a pen electrode holder for just one hand? Ihave a sls lipo 3s 5100 mah 140c capable. This looks pretty normal. 140C at 5000mAh (5Ah) would be 700A maximum current. Also please note that the current measurement of the Spot Welder is not super accurate. Real current can be about +-50A different. Do you think the pulse current could be more with a better battery. This is the best i have, i have test all my batteries. 800 amps or so is my goal. Is the voltage drop normal ? Is it possible to reach more amps than the 526 ones. I have no stronger battery. Why would you want that much current ? If you put two 4000mAh 3s 130C packs in parallel you could get close to the 800A. But that is then pretty close to killing the spot welder. I only tested it with a 800CCA car battery maximum.